That is my man. Hands off, ladies! After lunch at home, I went out and fed Eddie his afternoon snack (feeding Eddie is a full time job when he is in hard work, but he looks better than ever. I really like the new Purina SuperSport amino acid supplement. It has put muscle on Eddie like he has never had before.) 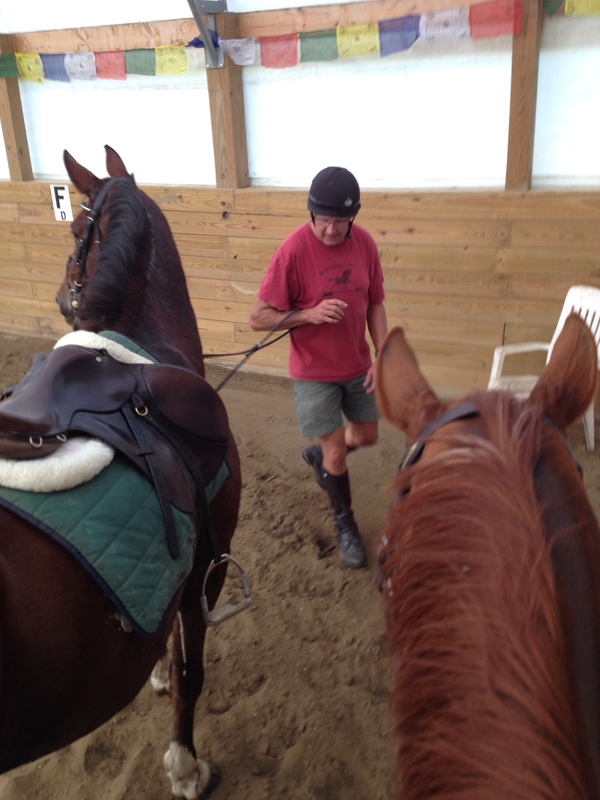 While he ate, I tacked up Elliot for Jay to ride and Sammy for me to ride. Jay had been working around the yard in shorts, and came up with the fabulous getup you see at left for riding, which would allow him not to have to change into breeches. I wondered aloud concerning whether he was going to wear off the skin on his knees and he seemed sublimely unconcerned, so off we went, on a 3 mile trot and canter hack. He is legging himself and his horse up for foxhunting, and for myself, just because it is Eddie’s day off, doesn’t mean I need to rest, so I was interested in a vigorous ride too. Not once did Jay complain or suggest we walk or slow down. However, when we returned, we ran in to Vicki Klemm and she asked about whether he always rode in shorts in summer, and he said no and he probably wouldn’t again. Lol. In the early evening I went to the local orchard to buy a bunch of apples. Little known Camie fact, I spent the first three years of my life living on an apple orchard that my dad worked at. I don’t remember much of it, but the people who owned it were always friendly as I grew up, and I worked there a few autumns picking apples for them. As such, I am a bit of an apple afficionado. So each year, predictable as a salmon to spawning grounds, I go and buy MacIntoshes in heaping mounds from the orchard and OD on them for about a month. I also buy about half a bushel each year of Cortlands and make treats for the local landowners who allow me to ride on the edges of their crops in the growing season and on the fields generally after harvest. This is a big help to my training and conditioning program for Eddie and all my horses, so I make them apple deliciousness in gratitude. It will have to wait until after the ATCs, but it will happen. I like to cook with Cortland apples and they sell out at this orchard, so I had to buy them today. 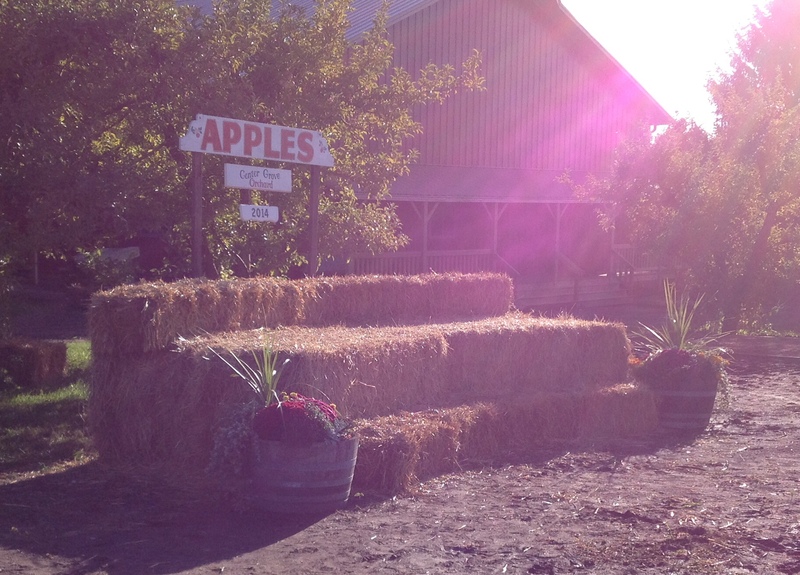 On my way in to the store, I saw the straw bale benches they built for classes of students to sit on for picture proof of their trip to the apple orchard. It is a pretty appreciable stack and I found myself thinking that, at this lovely xc obstacle, you’d have to check up a bit and then come forward to it to get the horse to jump across the width of it. Ha ha. The xc riding never ends.